Have you ever wanted to move a small portion of your belongings into storage? How about shipping your grandmother's dining room set as a wedding gift? Or moving your son’s bedroom set into his new apartment? Perhaps you want your patio furniture transported to your out of state time-share for the summer, or you just bought a room-full of furniture at an estate sale in another city. 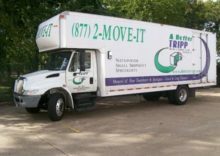 A Better Tripp Moving & Storage will conduct your move for you without a hassle. We specialize in small, cross country moves, and shipments of and single items. In fact, we have no minimum weight requirement. Be it your old Harley Davidson or your heirloom piano, your belongings will be moved safely by licensed professionals. Don't sweat the small stuff--leave it to A Better Tripp. We are fully licensed and insured movers providing Interstate moving services. Other specialty services include pianos, auction item shipments, and estates.